Will artificial intelligence dominate the economy and our every day's lives and tend to replace people? Will intelligent machines make politics?? In her new book „The end of democracy“ Yvonne Hofstetter sees strong signs for this development. Big data is storing our behaviour, while artificial intelligence is analysing our intentions. By knowing us, they can manipulate us, can patronise us without our knowing. The restructuring of society into a governance of artificial intelligence is in full progress. There has never been a democratic vote on whether or not we want this to happen. Are freedom and democracy in danger of being crushed between failing politics and big data? Hofstetter warns of simply damning big data and continuing in the same way as before. By means of highly explosive scenarios such as the election of an extreme right-wing government, the Euro crisis and the closing of internal European borders her book shows how intelligent machines would independently calculate and meet political challenges. In her opening keynote, the author will address “digital society”: Hofstetter regards the global mega trend of digitisation as a silent revolution. Despite the fact that digitisation is changing all aspects of our lives, hardly anyone seems to be able to explain what is happening or how our lives will be changed. 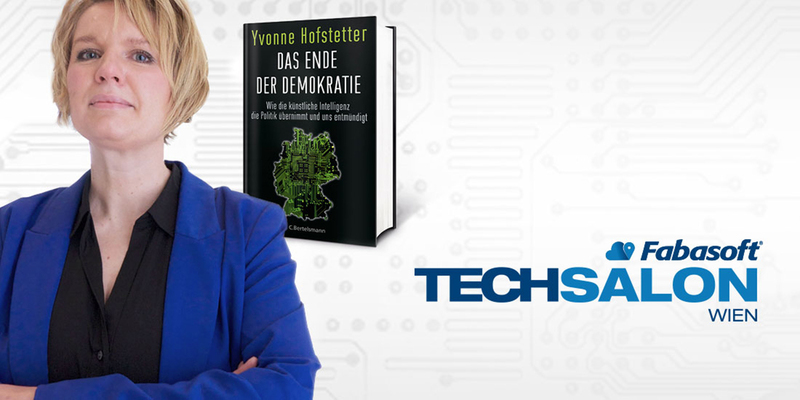 Following her presentation, Yvonne Hofstetter will answer your questions and sign copies of her book “The end of democracy” at the book table. The 21st century is turning into a digital era in front of our eyes. Digitisation is neither good nor bad, neither a demon nor the smart new world. There is no question of whether or not we want a digital future. Yvonne Hofstetter, best-selling author, lawyer and popular speaker, has specialised in the development of intelligent machines for some twenty years. The insider is taking the opportunities of big data and artificial intelligence seriously. As the Managing Director of a company that employs artificial intelligence not only in the test environment of its research labs but also for operational use in the industry she knows: what sounds like science fiction is already reflecting the reality of our time. How are digitisation, big data or artificial intelligence interwoven with our free and democratic society? With economic growth and a capitalist social order? Where is the cradle of digitisation, where are we standing today and how can we continue? Can we find new answers to the financial and Euro crises if artificial intelligence is taking control of politics? In her presentations, Yvonne Hofstetter is giving answers to these questions and is using highly explosive scenarios to examine what a humane digital future might look like. Lukas Sustala, editor-in-chief of NZZ.at, will moderate the event.